I wrote a couple of days ago about a suspected fake Apple store that popped up in Kunming, China. The fake Apple store was decked out in all the standard Apple garb. The employees were wearing blue shirts. Everyone was happy and smiling. And there were even Apple devices laying out on to play with such as the iPad, iPhone, and iPod Touch. But what was out of line, according to the initial whistle blower, was the paint on the walls was chipped, the Apple store sign out front actually said “Apple Store” – when any true Apple fan knows that Apple would never do such a thing; Apple simply puts out a sign with the Apple logo and no text. Apparently all the publicity has taken an effect in China, and it is now reported that China officials will be moving in to close down the fake Apple store. 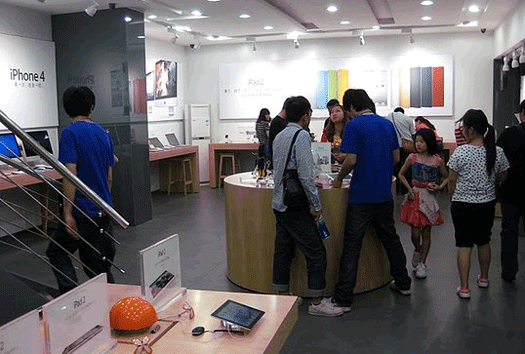 And from the initial reports, there was reportedly at least three fake Apple stores in Kunming, China.